Burmese pythons, natives of southeast Asia, began gaining a foothold in the Florida Everglades in the mid 1980s. The first ones likely escaped from pet stores or were abandoned by owners who found their pets had grown too large for their liking. Today, they are thriving. No one knows exactly how many pythons live in the Everglades, but some biologists put their numbers in the hundreds of thousands. This spells very bad news for local wildlife, as well as unlucky house pets. Burmese pythons grow to an average length of 12 feet. They have a diverse diet, essentially eating anything they can suffocate with their coils and swallow whole. In Florida, this includes endangered species like the Key Largo woodrat. A team of scientists from several universities and the U. S. Geological Survey recently published a study confirming what conservationists feared: populations of Florida's small and medium-sized mammals have plummeted in areas where the invasive pythons are found. Between 2003-2011, the scientists covered over 35,000 miles of tracks in the Everglades National Park, counting they animals they saw. Their census revealed that since 2003, opossum numbers have declined by 98.9 percent. The bobcat population fell by 87.5 percent. Raccoons, previously one of the most frequently seen animals in the Park, decreased by 99.3 percent. And they never saw a single rabbit. 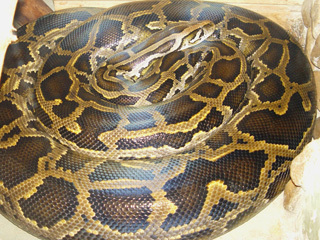 The authors of the study cannot prove that Burmese pythons are responsible for these numbers. But they have some pretty convincing evidence that suggests the giant snakes are to blame. Mammal populations have suffered the greatest losses at the southern end of the park, where pythons were first spotted decades ago. In other areas where the snakes have only recently established themselves, the mammals' numbers haven't fallen as much. And outside of the park, where pythons have not been recorded, mammal populations are much healthier. The Burmese pythons making their homes in the Everglades pose much more of a danger to rabbits, raccoons, and cats and dogs than they do to people. Pythons have killed at least nine people in the United States since 1999, but all of these cases involved pet snakes. There has never been a case of a wild-born python killing a person in the U.S. Yet.